If you are struggling to enjoy your life, or wish you could enjoy it more, then this book is for you. 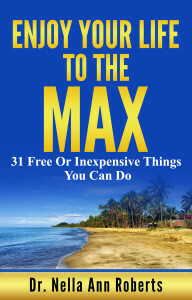 In it I share with you 31 free or inexpensive things you can do to help you enjoy your life to the max. Enjoying one’s life to the max means living fully and having the best possible experience that makes you happy. You do this on a daily basis. As you focus on living fully and having the best possible experience from every day, you will enjoy your life to the max, and you will be a happier person. This book will help you enjoy your life to the max. It is written in a concise manner with simple, practical things you can do beginning today. Some things may be new to you and others may be reminders (as they are for me). Many of us need to be reminded about certain things at times, including making enjoying our lives one of our priorities. Download and read Enjoy Your Life To The Max and start enjoying your life more from today.